Set around a gently sloping headland on the northern tip of Samui Island, this outright and romantic property ensures maximum privacy as well as breathtaking views of the Gulf of Thailand. The villas at Six Senses Samui are conceptualized in a contemporary style with an en-suite bathroom and porch area. Of the 66 villas, 52 come with a private infinity-edge swimming pool, maintaining a feeling of seclusion. Along with its cozy accommodation, guests will never run out of things to do with a number of recreational facilities on-site – be it yoga at sunrise, deeply relaxing spa treatments, basking in the sun at the private deck of your villa, going for wine tasting, trying your hand at one of the Thai cooking classes, or heading out for day trips discovering the many delights of the island. Never worry about having to even lift a finger, and have your every request catered for when you pick Six Senses Samui for your next vacation. Short Description: Set around a gently sloping headland on the northern tip of Samui Island, this outright and romantic property ensures maximum privacy as well as breathtaking views of the Gulf of Thailand. 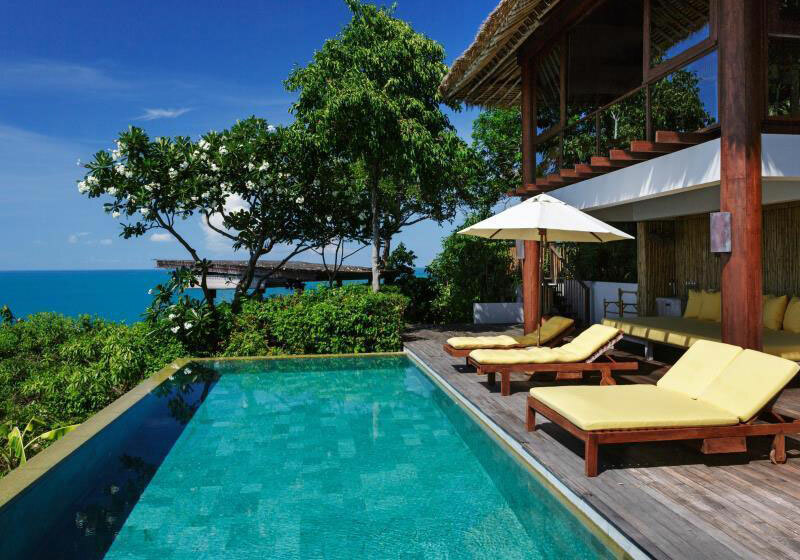 The villas at Six Senses Samui are conceptualized in a contemporary style with an en-suite bathroom and porch area.